GLAROS HOTEL is a B class hotel in Kamari - Santorini, which operates since 1989 and carries the traditional hospitality with family atmosphere. The hotel is divided into three parts with totally 26 rooms and a nice garden around. 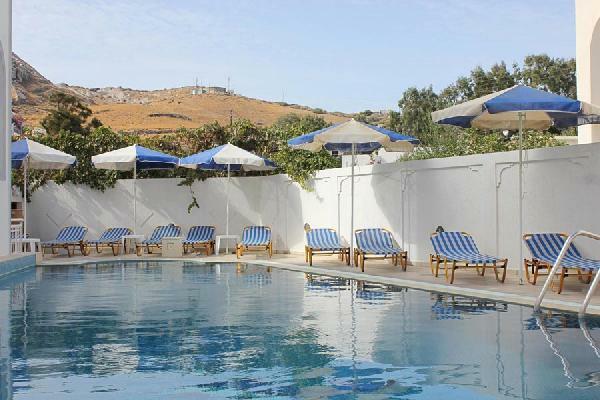 The hotel is situated in a quiet area in Kamari, only 150 m from the beach, 100 m from the bus station, 8 km from the Fira - Town. Kamari is famous for its marvellous beach covered with black sand and pebbles, the city of "Ancient Thira" (1900 BC) and the numerous picturesque greek tavernas. A perfect place to enjoy your Holidays !! Είστε ιδιοκτήτης ή διευθυντής στο GLAROS HOTEL; Εγγραφείτε τώρα για δωρεάν εργαλεία, που μπορείτε να χρησιμοποιήσετε για να βελτιώσετε την καταχώρησή σας και να συνδέσετε την ιστοσελίδα σας και το σύστημα κρατήσεών σας.